Dublin tramway workers pass the Rotunda, one of the city’s most important picture houses. 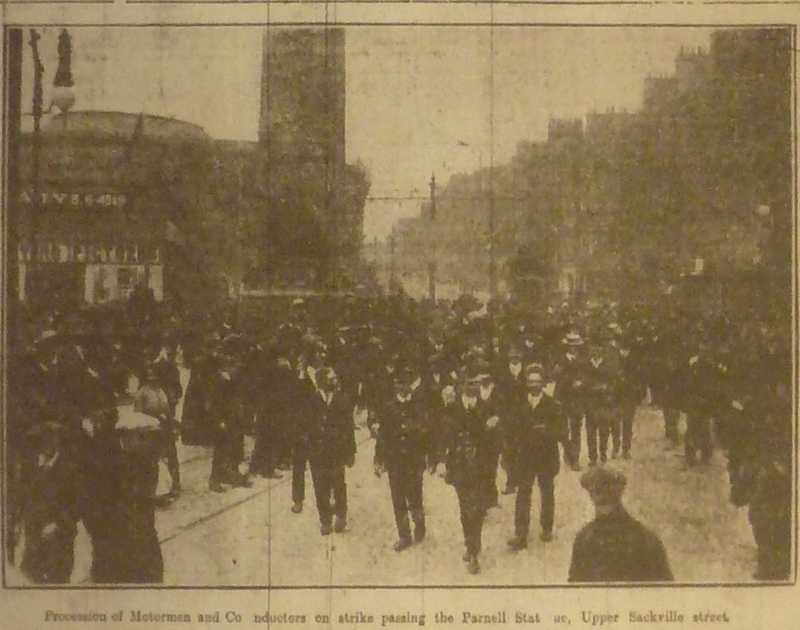 (“Dublin Tramwaymen’s Strike.” Dublin Evening Mail 27 Aug. 1913: 2.) A different view of this picture house can be found here. A hundred years ago, on Tuesday, 26 August 1913, the labour dispute known as the Dublin Lockout began when just before 10am, some 200 motormen and conductors of the Dublin United Tramway Company abandoned their trams in the city centre. The tram strike would prompt the Dublin Employers’ Federation – led by the tram company’s chairman and owner of the Irish Independent and Evening Herald newspapers William Martin Murphy – to lock out workers affiliated with Jim Larkin’s Irish Transport and General Workers’ Union. Riots, the arrests of union leaders, demonstrations and vicious police baton charges followed. Newspapers played an important part in this dispute – and in how we remember it a century later; see Century Ireland – but what about cinema? As early as 1907, cinema was being called the art form of the working class (Patterson), an accessible and relatively cheap form of not just entertainment but also information about the world in moving pictures that did not require a high level of literacy. Although Dublin had just a few film venues before 1910, the new medium of cinema very quickly came to have a significant place in Irish society in the early 1910s. By August 1913, Dublin had three times more picture houses than it did theatres, and half of the theatres also showed fiction films and newsreels on a regular basis as part of their variety programmes. Picture houses were not only located in the city’s business core like the theatres but also in residential areas and in the suburbs and townships adjacent to the city. They often therefore relied to a greater extent than the theatres on the patronage of local audiences. However, these picture houses were also businesses, in which a dichotomy between worker and employer also existed. If its conclusion were to be interpreted in one sense the raging fire against which by mutual help the employer and employes in the end fought successfully may be taken to picture anarchy. When both sides to the struggle came to recognise the peril which threatened them, they ceased to quarrel, and, turning their strength against the common foe, they subdued it, and then taking a juster measure of one another it looked from the last film as if they were likely “to live happily together ever after” (“The Rotunda”). How Dublin workers and employers might – Metropolis-like – identify a common foe, the writer does not speculate, and a happy ending to the dispute must have seemed remote to anyone walking the city’s streets. In any case, the film’s engagement with radical labour politics would likely have been diluted not just by its conclusion but also by its appearance on a bill with the live telephatic performer La Somna, a screen adaptation of Ivanhoe (IMP, 1913), and two film comedies featuring Vitagraph star John Bunny. Advertisement for the Round Room Rotunda showing Kalem’s The [Great] Labour Struggle and a local film of the Neptune Rowing Club. Dublin Evening Mail 1 Sep. 1913: 4. Apart from fictional representations produced elsewhere, local film producers could have filmed the demonstration themselves to produce a local news film. Norman Whitten had set up a company in May – with an office at 76 Talbot Street (“Irish Enterprise”) – to take such films. James T. Jameson and his sons, including Ernest who managed the Rotunda – but Ernest had got married on Thursday 28 August, so perhaps he deserves congratulations and the benefit of the doubt – had been shooting such films for a decade. Tellingly perhaps, neither Whitten nor Jameson caught on film Jim Larkin’s famous address to the proclaimed demonstration of workers in O’Connell Street on 31 August or the notorious baton charge that followed it, despite the fact that both had business addresses on or just off that street. The bills at Jameson’s picture houses had long been known for their local films. During the week of 25-30 September, both the Rotunda and the Jameson-run Town Hall Rathmines had shown films of each day of the prestigious Dublin Horse Show. And in lieu of a local strike film, The Labour Struggle was accompanied at the Rotunda by a film of a social event at the Neptune Rowing Club, “a local event of direct personal interest to numbers of the citizens” (“The Rotunda”), but those citizens were likely to have been the middle-class audience Jameson had long courted. For Horse Show Week 1913, Dublin’s Phoenix Picture Palace revived Quo Vadis? Evening Telegraph 9 Aug. 1913: 2. Other exhibitors more reliant on a working-class audience do not seem to have modified their bills in response to the strikes even to the extent that Jameson did. The Phoenix Picture Palace on Ellis Quay widely advertised the fact that it was showing Quo Vadis? (Cines, 1912) for the whole of Horse Show Week; in April, the Phoenix had been the first Dublin picture house to show the Italian spectacular. A similar taste for a full week of spectacle to attract well-heeled Horse Show visitors inspired the Dame Street Picture House to book The Life and Works of Richard Wagner (Messter, 1913), which allowed the house orchestra to accompany the silent film with a different Wagner selection at each performance. 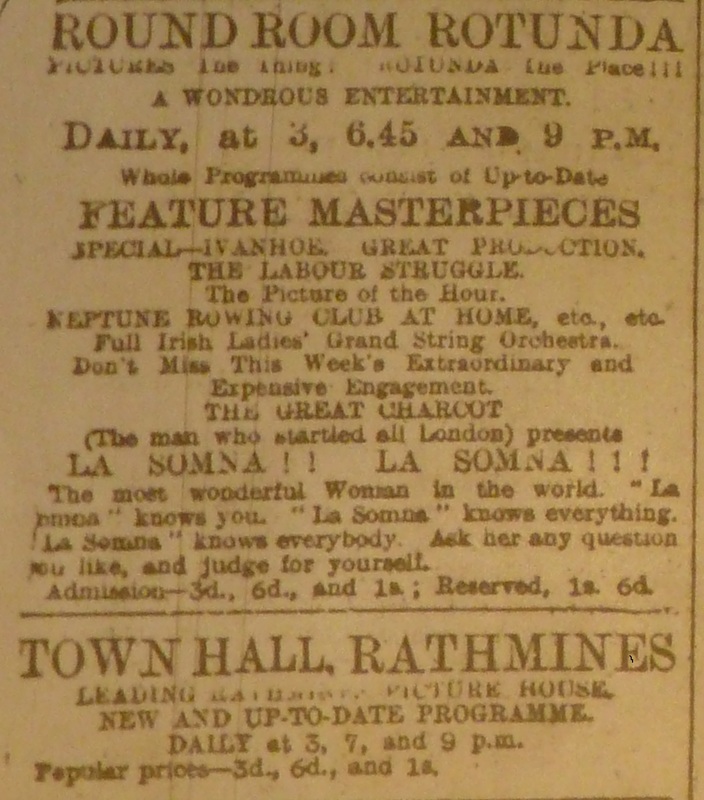 Other programmes from picture houses that advertised in the newspapers at this time – the Town Hall, Rathmines, the World’s Fair Varieties, the Mary Street Picture House, the Picture House, Sackville Street (called the “O’Connell Picture House” by the nationalist press), the Grand, the Volta, the Theatre de Luxe, the Camden Picture House, the Clontarf Electric Theatre and the Assembly Picture Hall, Serpentine Avenue – show no immediate impact of the Lockout. Although the picture houses largely failed to represent the early days of the Lockout on screen, the impact of the struggle for workers’ representation that was being fought out in the streets was also felt in the auditorium, projection booth and cash box. Dublin projectionists had organized themselves into the Irish Cinematograph Operators’ Association and initially affiliated themselves with the National Association of Cinematograph Operators (“N.A.C.O. Dublin Branch”). However, in order to represent themselves in solidarity with other picture house workers, the projectionists later affiliated instead with the National Association of Theatrical Employees (NATE). As a result, even the unskilled cinema workers were able to make strong demands for fixed wages to the cinema owners at a special meeting of the Irish Cinematograph Exhibitors’ Association in early September: “In the case of the doormen this should be 26s. for the first doorman, 20s. for the second, and 18s. for the third. It was also proposed to give the inside attendants 12s. per week, the cash-box girl getting 15s” (“Pictures in Ireland”). The cinema owners were not altogether happy with these proposals, and by mid-September, NATE members would be picketing the Theatre de Luxe in Camden Street (Rockett 43). But that is a story for another day. “Irish Enterprise.” Bioscope 12 June 1913: 781. “N.A.C.O. Dublin Branch.” Bioscope 29 May 1913: 623. Patterson, Joseph Medill. “The Nickelodeons: The Poor Man’s Elementary Course in the Drama.” Saturday Evening Post 23 November 1907: 10+. “The Queen’s Theatre.” Evening Telegraph 2 Sep. 1913: 2. Rockett, Kevin and Emer. Film Exhibition and Distribution in Ireland, 1909-2011. Dublin: Four Courts, 2011. “The Rotunda.” Evening Telegraph 2 Sep. 1913: 2.